My CT has a tendency to gently roll left wing down when cruising straight and level, not a lot, but enough that you can't take your hand off the stick. It's a late 2006 build and I don't think has the aileron trim that later aircraft have. How do I adjust the ailerons to dial out the roll? I have an early 06 build , (December 05 serial number) and it has 3-axis trim. I find untrimmed flaperons to be annoying. Thanks Ed, but unless I'm looking in completely the wrong places, the only trim wheel I have is for the stabilator. There's nothing on the rear cockpit bulkhead, which I believe is where the rudder trim would be, and nothing behind the little moulded in pocket on the centre console which is where I think the aileron trim wheel is? You don't seem confused. My CTSW with 3-axis has a serial number almost 11 months earlier than yours. Weird. Wonder if it was an option that the original buyer of mine didn't select? Any idea how to adjust the roll trim on an aircraft without trim adjusters? You have pitch up next to the throttle, you have the aileron trim down by your hips in the center console and you have the rudder trim back by the parachute handle. The aileron trim down by your hips on the center console moves left and right with the wheel. It can be harder to move than the other two trims, but that's normal in most CT's. Hey guys, remember he is from across the pond, and the airplane may be a different version than was delivered in the US. I wouldn't be surprised if that was omitted in the light weight UL model. I actually have a similar problem - it is not a CT plane but the issue is similar - if I fly by myself , I have to ever slightly keep the plane from very slowly banking to the left - if I fly with a passenger ,it doesn’t do that or at least is much less pronounced . I encounter the imbalance all the time because I fly from the left and mostly use only the left fuel tank. If I had not trim I would put fuel in the right tank when solo and both tanks when 2 up. Ballast in baggage and foot lockers is another option. Rudder trim should be the harder one. A custom fix for that would be a glue on trim tab that you could bend. I definitely don't have rudder or aileron trim. As Tom says, there's every chance it was left off for weight saving to get it into our Microlight category. I've emailed Flight Design and asked if it's available as a retro fit. Yes, I noticed it when flying solo, but 90% of my flying is solo (normally in a squadron of EV97s, Eurofox and C42s). There just be some adjustment in the aileron system somewhere. Will call the UK Flight Design rep on Monday. You could adjust it at the rodends. Either out at the aileron or inside the inspection port. My 2006 CTSW when rigged according exactly to the service manual has a tendency to roll significantly to the right in cruise. To compensate for this some might try to readjust the ailerons however it is difficult as they will seek their own neutral position. I find to get any good result seems difficult. I have seen this on many aircraft with no option to change the wing angle of incidence, such as Piper Cherokee's. The easiest way to compensate for the roll with the least amount of drag is to slightly lower one flap to counter the roll, it doesn't take much. These CT's are hand built and even a very small deviation in wing geometry will cause a roll tendency, (I have discussed this with Flight Design years ago). I have done a lot of aircraft this way and it works well when there are no other good options. There are springs in the luggage compartment to make small corrections to the roll trim. a little more tension on the left spring should correct the roll"
Haven't tried it yet, but will do during the week. I think you will find that the springs are only for giving some resistance to the controls and may be contributing to preventing an aileron flutter situation. My reason for making roll adjustment with flaps is to keep the ailerons reasonably even. 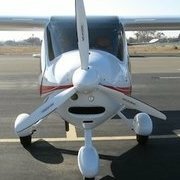 I have tried aileron changes on other planes over the years and have found myself going in circles with aileron and stick or wheel positions, flaps are easy and are not noticable. The only issue with the CT is access to the flap adjustment as you have have to be 3 feet tall and can stand up in the baggage compartment. (Ibuprofen helps). My CT roll issue was very significant and took a significant aileron response. If yours is minor you probably can correct it much more easily and adjusting spring tension would be like having aileron trim, sound good. The easiest way to compensate for the roll with the least amount of drag is to slightly lower one flap to counter the roll, it doesn't take much. How would that affect roll characteristics when flaps are extended during approach and landing . . . at varying speeds and varying AOA? My CT has no changes with any flap setting or aoa. You would never notice any difference, my ball is centered and no change in speed. With my flaps at 0 degrees my right flap is about 1/4 to3/8 inch below the fuselage fairing trailing edge. My roll issue is significant so it doesn't take much. What’s the Facebook link for the U.K. CT page please? Hi, it's "CT Flyers", don't think it's specifically for UK, but is certainly predominantly UK folks.